Mayonnaise is easy to come by. Conveniently packaged and sitting on the grocery shelf proclaiming to be some kind of miracle, it’s hard to miss. But (of course you knew there was a “but” coming) like many convenience foods, that convenience comes with a price, and not just dollars. Take a look at the ingredients the next time you see a jar of mayo – notice some funny stuff that you don’t usually have in your kitchen, like xantham gum, modified food starch, or cellulose gel? They’re also usually laden with preservatives (how else could it have a shelf life so long? ), and most of the volume comes from soybean (most commonly) and canola oil, both of which are almost always GMO. 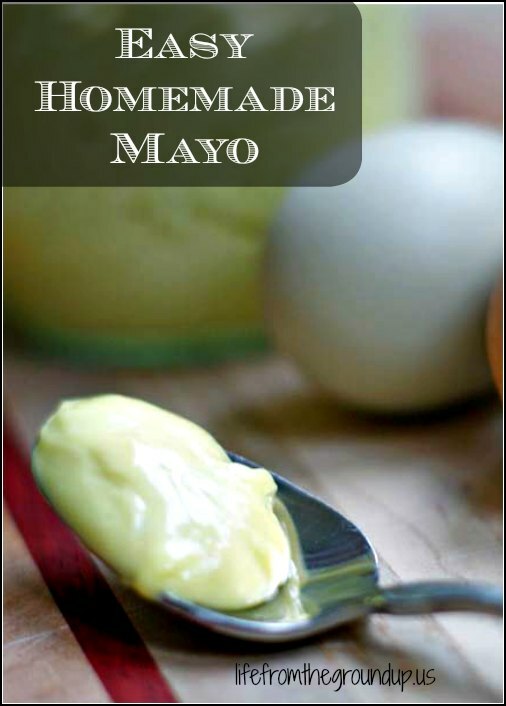 Okay, so now that the scare-mongering is out of the way, how about I just tell you that homemade mayo is easy to make, cheaper than anything you could buy, and tastes a Hellman’s of a lot better (did I just do that?) than, uh, Kraft. I love mayo’s versatility. Spread it on sandwiches, use it as a base for coleslaw or cucumber salad, or pile it (and some cheese) on top of a tomato pie. It’s creamy, a little bit tangy, and even kinda good for you if you use decent eggs and oil. If you don’t have chickens, you should at least get some so you can make truly homemade mayo. 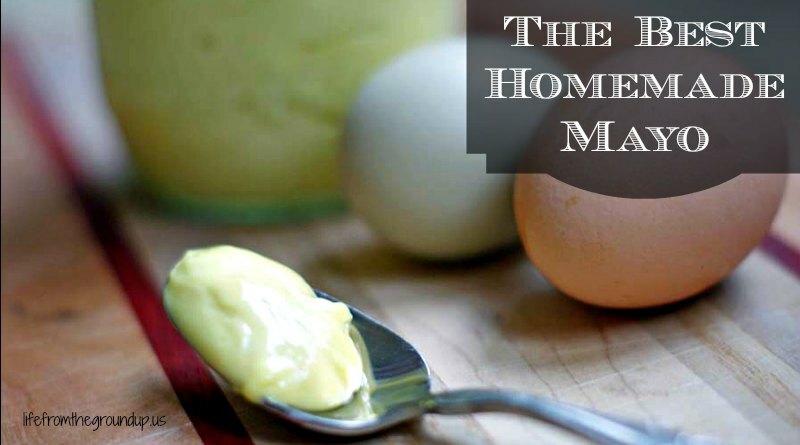 Homemade mayo was something we’d looked at before, just never got around to it. But I give due credit to S here, who broke down one day and decided to give it a whirl. And we’ll never look back. It can be a little fickle, as you may have heard. I’ll forgo the science lesson, but suffice it to say, you can’t just dump everything into a bowl and expect good results. Keep things room temperature and go slowly. We used a food processor for the hands-off approach, but you should be able to do just fine with a bowl and a whisk. In a food processor or small bowl, combine the egg yolk, lemon juice, and vinegar, and blend until smooth, 10 seconds or so. With the processor on, SLOWLY drizzle the oil into the mixture. If the oil ever stops emulsifying, stop adding more until the rest of it is combined. This will take at least several minutes, but don't rush. Mix in salt, pepper, or mustard when the oil is finished. Put in a mason jar and refrigerate; it should keep for at least a week or two. It is even easier and faster using a stick blender in a wide mouth pint Ball jar. Zip…done! You only have to clean the stick blender because the jar becomes the storage container. Add a couple tablespoons of whey from yogurt or cheese and the shelf life doubles, too.